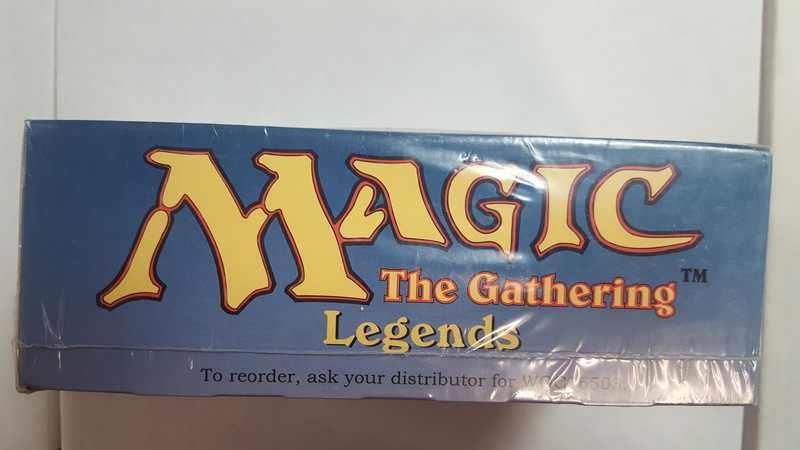 Magic the Gathering MTG Legends booster box contains 36 booster packs with 16 cards each ( one white rule card ). 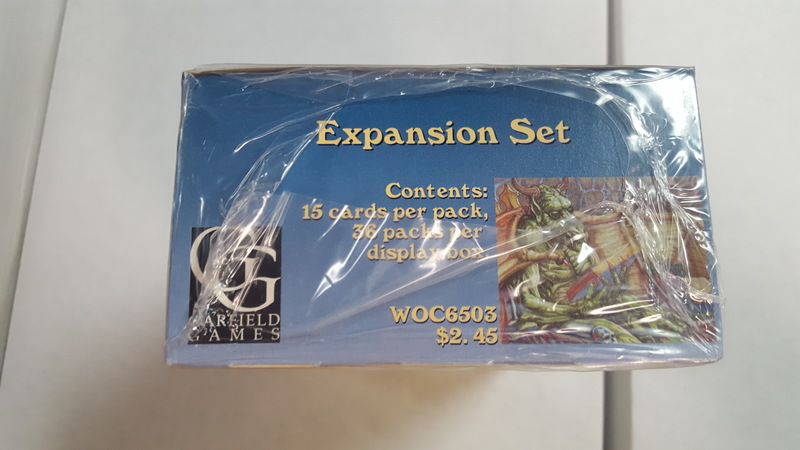 Released in June of 1994, Legends is an unaffiliated set. The set contains 310 black-bordered cards (121 rare, 114 uncommon, and 75 commons). The uncommons are comprised of 107 U1's and 7 U2's. The commons are comprised of 29 C1's and 46 C2's. 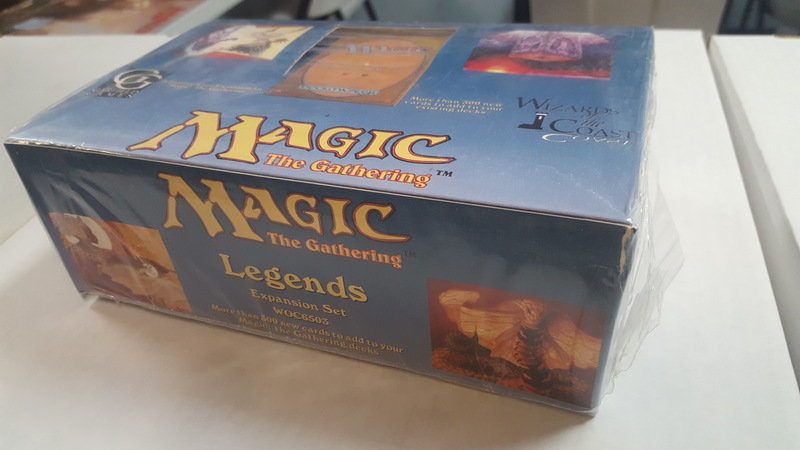 Legends was the seventh Magic the Gathering set and the third expansion set. 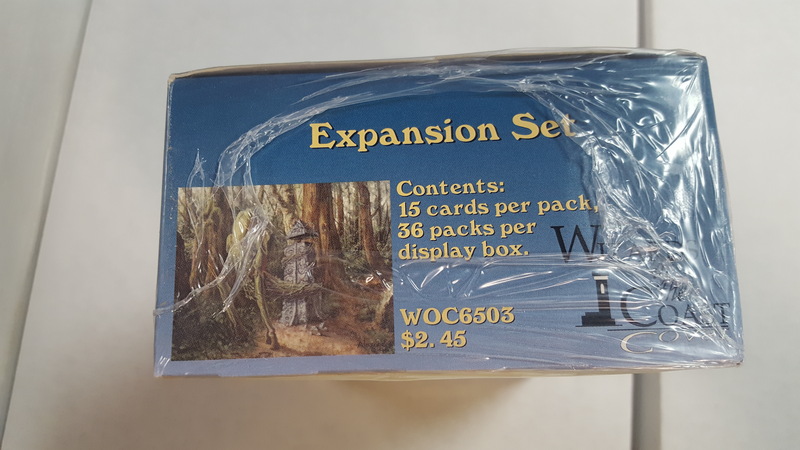 It was the first expansion set to be sold in packs of 15 (previous expansions had been sold in packs of 8). The set was designed by WOTC co-founder Steve Conard and friend Robin Herbert in Canada before the game was initially released. Legends introduces several mechanics and keywords to the game, but the focus of the set lies clearly on the Legends themselves. These were the first mulitcolored cards in the game. They are also special in that they are all Legendary creatures, meaning that only one of each type can be in play (not quite true anymore, see the new legend rule). The expansion symbol for Legends is the capital of a column. Legends had none of the errors that were common in the preceding Magic sets. The problem of poor collation, that had already plagued Antiquities, persisted, though. 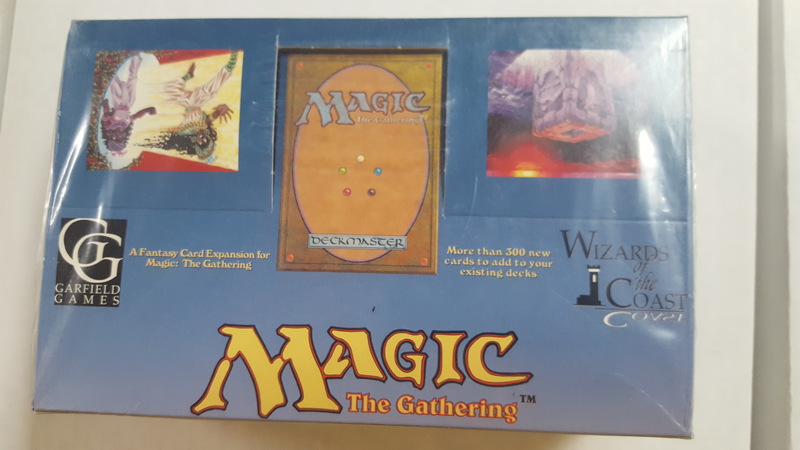 Each booster box contained only half of the uncommon cards in the set. This along with the limited number of cards available made collecting the entire 310-card set very difficult. Legends is the oldest expansion for MTG to have been printed in a foreign language; the Italian Leggende was released in 1995, shortly after L'Oscurità (Italian The Dark). These two expansions were released in the opposite order in their original English printings. The first set to be released in a foreign language was the Revised Edition which was not only printed in Italian, but also in German and French. The story line of the Legends set was not formulated until the three Legends Cycle books by Clayton Emery were released in 2001 and 2002. It follows the adventures of Hazezon Tamar who teams up with many other legends from the set such as Jedit Ojanen. The story takes place in the southern regions of Terisiare well after the Ice Age, and sometime before Weatherlight as the first Airships are built by Johan who tried to conquer the entire continent. Many other legends of the set end up fighting Johan's army at the battle for Efrava. Legends introduce several important mechanics to the game and each pack of cards contained a rules card explaining the new mechanics and keywords. Legendary - The Legendary play mechanic, known as the "Legends Rule" was introduced in this set. Legends are powerful creatures that were allowed only once in a deck when Legends came out, but this restriction has been dropped since. As a further restriction only one copy of a Legend can be in play at a time. Legends provided both Legendary Creatures and Legendary Lands, while Legendary Enchantments would not arise until Champions of Kamigawa. Enchant World - Enchantments that enchanted the entire "world." These enchantments would have an effect that affected all players at the same time and were limited to only one in play at a time. Multicolor - Legends was the first set to include cards that required more than one color of mana to play. These cards were distinguished by a gold background and have become much more commonplace (The last expansion of the Alara block, Alara Reborn, is composed of entirely multicolor cards). Rampage - An ability that took effect whenever said creature became blocked by more than one creature. Creatures with Rampage would get a bonus to their power and toughness for each creature blocking it beyond the first. Banding - A very complex game mechanic that was eventually dropped from the game after Weatherlight, Legends further complicated matters by creating creatures that banded only with creatures of a certain type. In essence, banding allowed multiple creatures to attack as a single unit, allowing the attacking player to decide how damage was distributed to his or her creatures, if the defending player blocked. Legends is the only set to feature the "bands with other" mechanic, with the exception of the Unhinged card Old Fogey. Purchase requires good funds (cashier's check) or a significant account history. The pictures are of the actual box you will receive. Please review them carefully.